The effects of 13 indigenous microorganisms with distinct colony forms isolated from soils and sediments containing W of 64~113 mg/kg on the behavior of dissolved W(VI) were experimentally investigated under anaerobic condition. 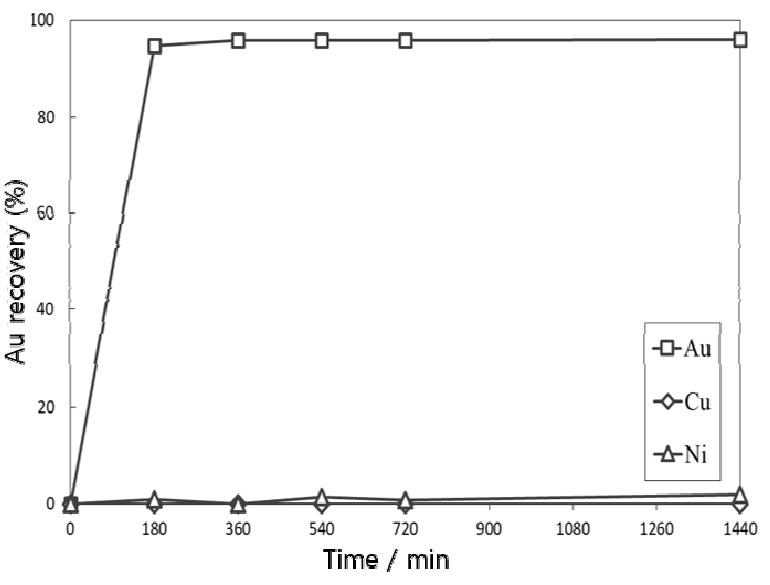 Compared with abiotic control (94 mg/L), eight bacteria decreased more than twice the amount of dissolved W (192~378 mg/L) forming precipitates in response to 1,000 mg/L W(VI) supply. The consecutive experiments using Klebsiella sp. and Pantoea sp. among the isolated microorganisms also showed that they reduced greater amounts (210~309 mg/L) of W(VI) to W(IV) than abiotic control. Such microbial reduction of W(VI) might be due to pH decrease by fermentation. In addition, for Klebsiella sp., detoxification was likely one of the mechanisms of W(VI) reduction. The results, which are the first evidence to our knowledge of the effects of microorganisms on geochemical behavior of W, indicate that microorganisms may influence the cycle of W in geological media. 64~113 mg/kg의 W를 함유하는 토양 및 퇴적물에서 외견상 집락이 구분되는 13종류의 토착 미생물을 분리한 후 이들이 혐기성 조건에서 용존 W(VI)의 거동에 미치는 영향을 실험적으로 조사하였다. 1,000 mg/L의 W(VI)를 주입한 결과 8종류의 미생물이 무생물적 비교시료(94 mg/L)에 비하여 2배 이상의 W(192~378 mg/L)를 용액으로부터 침전시켜 제거하였다. 이들 중 Klebsiella sp.와 Pantoea sp.로 동정된 두 종을 이용하여 추가 실험을 수행한 결과, 비교시료에 비하여 월등히 많은 양(210~309 mg/L)의 W(VI)를 W(IV)로 환원하였다. 이러한 미생물학적 W(VI) 환원은 발효에 의한 용액의 pH 감소가 주된 기제인 것으로 보이며 Klebsiella sp.의 경우 W의 해독성 환원기제도 일부 고려할 수 있다. 이 결과는 W의 지구화학적 거동에 미치는 미생물의 영향에 관한 최초의 보고이며 지질 매체 내에서 W의 순환에 미생물이 영향을 미칠 수 있음을 나타낸다. 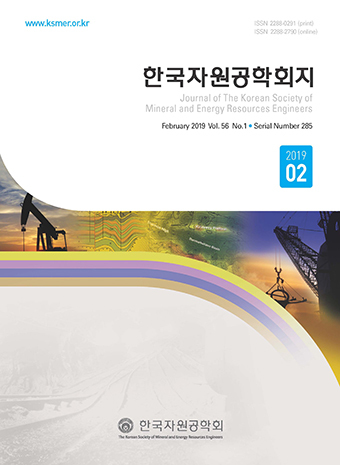 The quantity of heavy metals in 44 surface and subsurface agricultural soils was determined for the area around a coal-fired power plant located in Boryeong, Chungnam Province. 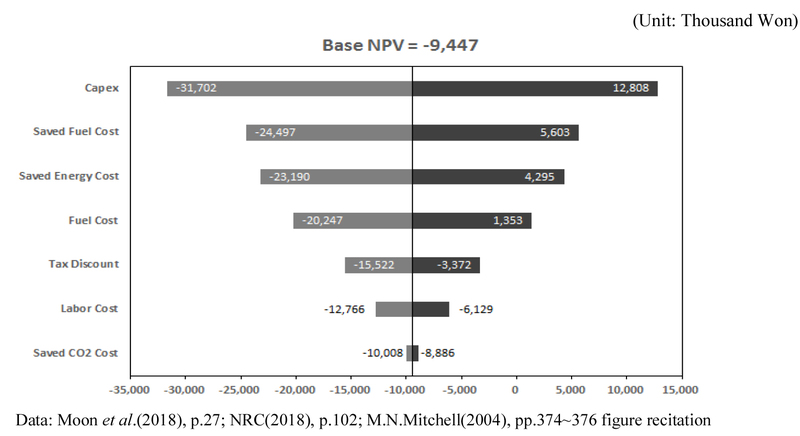 Although the concentrations of Cu, Hg, Ni, Pb, and Zn were below the warning criteria regulated by the Korean Soil Conservation Act, Cd in 16 samples exceeded the criterion. Geoaccumulation index showed that contamination intensity of Cd was significantly high while those of the other heavy metals were low. Enrichment factor indicated that Cd was loaded to the soil from anthropogenic source(s). However, sequential extraction of the soil samples revealed that most heavy metals including Cd existed as barely extractable phases, which represented low bioavailability of the heavy metals. Our results indicated that Cd contamination which was clearly due to artificial factors in the vicinity of the coal-fired power plant is unlikely to cause the deterioration of nearby ecosystem. 충청남도 보령에 소재하는 석탄 화력발전소 인근 농경지 토양을 대상으로 중금속 함량을 측정하였다. 총 44개의 표토 및 심토 토양을 대상으로 분석한 결과, Cu, Hg, Ni, Pb, Zn는 모두 토양오염 우려기준 미만으로 나타났으나 Cd는 16개 시료에서 우려기준을 초과하였다. 지질부하지수(geoaccumulation index)를 구한 결과 다른 중금속들은 오염도가 낮으나 Cd는 매우 높은 오염도를 보였다. 인위적 오염 여부를 판단하기 위해 농축계수(enrichment factor)를 구한 결과 Cd는 인위적 오염원에 의한 토양 내 농축인 것으로 나타났다. 그러나 중금속의 존재형태 규명을 위하여 연속추출을 수행한 결과 Cd를 포함한 토양 내 중금속들은 대부분 용출 가능성이 매우 적은 형태로 존재하여 생물이용도가 낮았다. 이러한 결과는 보령 석탄 화력발전소 인근 토양이 인위적인 요인으로 인해 Cd로 오염되었으나 인근 생태계에 해로운 영향을 끼칠 가능성은 낮음을 의미한다. 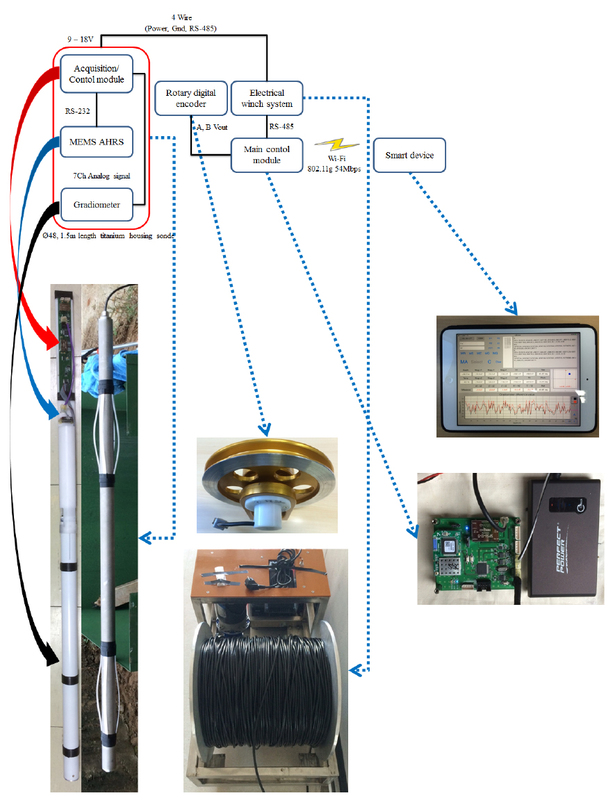 A smart device-based borehole deviation and magnetic gradient logging system is proposed. The whole system consists of a sonde, 500-m long electric winch module, rotary encoder module, the main control module, and a smart device. The sonde is made up of an attitude-and-heading-references-system based on digital output miniature high-precision microelectromechanical systems, a magnetic gradiometer sensor composed of two separated three-axis fluxgate sensors spaced 500 mm apart with analog voltage output, and a 24-bit analog-to-digital high-resolution acquisition/control module. The three component modules are situated in 1.5-m length 48-mm diameter titanium housing. To evaluate the performance of the system, preliminary field test was performed at 440-m borehole located in Ulsan samjeongri. The falling speed of sonde was 0.3 m/s and 2-Hz continuous measurement and monitoring were carried out. 최신 전자, 정보통신 기술을 활용하여 실시간 차분자기/편차 검층 시스템을 개발하였다. 전체 시스템은 존데, 500 m 전동윈치 모듈, 로터리 엔코더 모듈, 주 제어모듈과 스마트 디바이스로 구성된다. 존데는 길이 1.5m 외경 48mm 티타늄 하우징을 가지며 내부에 디지털 출력 초소형 고정밀 MEMS 기반 AHRS, 두 개의 3축 플럭스케이트 센서가 500mm 이격되어 있는 아날로그 고정밀 차분 자기센서, 24 비트 analog-to-digital 고정밀 계측/제어 모듈이 포함된다. 개발된 시스템의 기초현장시험을 위해 울산 삼정리 반정 저수지 옆 440m 시추공에서 0.3m/s의 속도로 존데를 하강시키면서 2Hz 연속측정을 수행하였다. 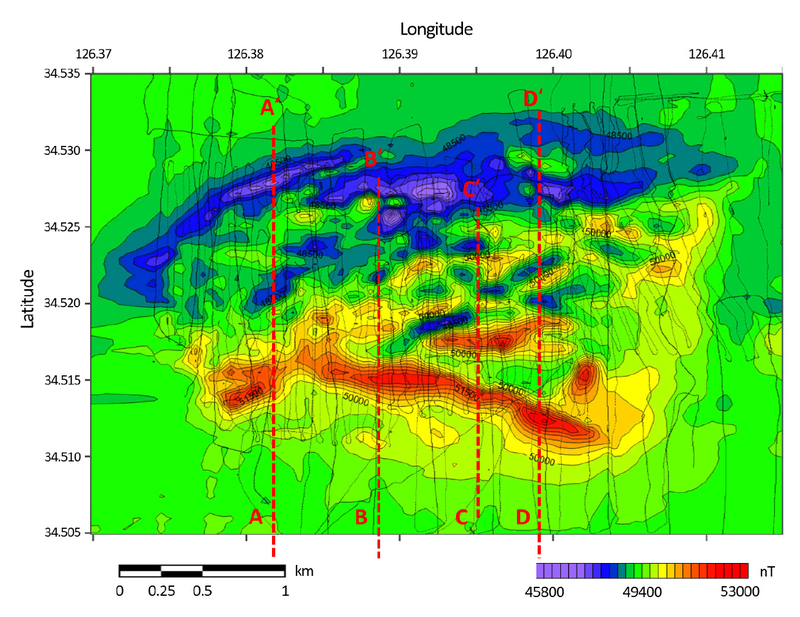 Significant magnetic anomalies were found in the coastal area near Haenam using an airborne magnetic survey for verification of gravity anomalies near the Haenam gold mine. A shipborne magnetic survey which has high resolution was conducted to delineate the magnetic anomalies the airborne survey. The map derived from the shipborne magnetic survey shows a strong magnetic anomaly of more than ± 2,000 nT, with width of 4 km in the east-west direction. The magnetic anomaly curves imply that several small and big anomalous bodies are mixed in the subsurface. The strong anomaly is in the form of an isolation, which is attributed to an anomalous source, not to the effect of the bedrock. Various geophysical approaches are needed in the study area because, unlike land sites, we cannot investigate the surface. 전남 해남지역에서의 중력이상을 규명하기 위하여 수행된 항공 자력탐사에서 해남 근해에 지자기이상이 발견되었다. 정밀 조사를 위한 해상 자력탐사를 수행하여 세밀한 총자기이상도를 획득하였다. 동서방향 폭 4km, ±2,000nT의 강한 지자기이상의 분포를 확인할 수 있었다. 측선별 지자기 이상도를 보면 이 일대 지자기 이상은 비교적 얕은 깊이의 소규모 이상대와 심부의 대규모 이상대 반응이 혼재되어 나타난다고 해석할 수 있다. 이는 고립된 형태의 강한 이상반응으로 그 원인이 기반암의 분포에 따른 영향이 아닌 이상반응원이 존재하는 것으로 해석 가능하다. 지자기이상이 규모가 크고 뚜렷하게 나타나고 있기 때문에 인근 육상과 같은 천열수광상 및 심부 반암동광상 등 대규모 광상의 가능성을 열어두고 추가적인 조사가 필요하다. 연구지역은 육상과는 달리 지표 조사가 불가능한 해상이기 때문에 다양한 지구물리학적 접근이 필요하다. 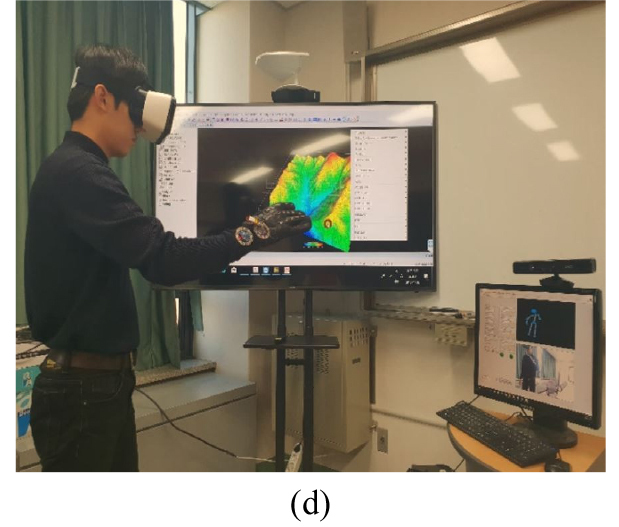 In this study, we developed a 3D user interface (UI) using the Microsoft’s Kinect sensor and bend-sensing data glove to control software in the mining industry. The developed UI controls the mouse cursor in Windows according to the user’s hand position tracked by the Kinect sensor. In addition, it controls the mouse click events in Windows by measuring the user’s finger flexion using the bend-sensing data glove. An open-source hardware, Arduino Lilypad Board, and National Instrument’s LabVIEW software were used to develop the UI. Applications of the 3D UI to several 3D software utilized in the mining industry revealed that it can control the 3D software in more intuitive way than traditional UIs such as mouse and keyboard. 본 연구에서는 마이크로소프트 키넥트 센서와 굽힘 감지 데이터 글러브를 이용하여 광업 분야 소프트웨어를 제어할 수 있는 3차원 사용자 인터페이스를 개발하였다. 개발된 인터페이스는 키넥트 센서로 추적되는 사용자의 손 위치에 따라 윈도우즈 환경에서 마우스 커서를 제어한다. 또한 굽힘 감지 데이터 글러브로 측정한 사용자 손가락의 구부러짐 정도에 따라 윈도우즈 환경에서 마우스 클릭 이벤트를 처리한다. 인터페이스의 개발에는 오픈소스 하드웨어인 아두이노 Lilypad 보드와 National Instrument의 LabVIEW 소프트웨어가 사용되었다. 3차원 사용자 인터페이스를 광업 분야에서 사용되고 있는 몇 가지 3차원 소프트웨어에 적용해본 결과, 마우스나 키보드와 같은 전통적인 인터페이스보다 더 직관적으로 3차원 소프트웨어를 제어할 수 있음을 확인할 수 있었다. 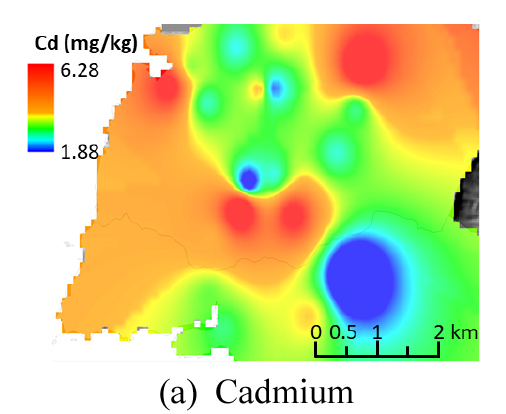 The production of gas hydrate using the depressurization method can lead to subsidence due to decreased strength and stiffness of hydrate-bearing sediments. Since subsidence could damage sea-bed facilities and production wells, it is essential to study this problem. In this study, geomechanical behaviors of hydrate-bearing sediments were predicted considering the properties of a field production test site in the Ulleung basin, East sea, Korea. 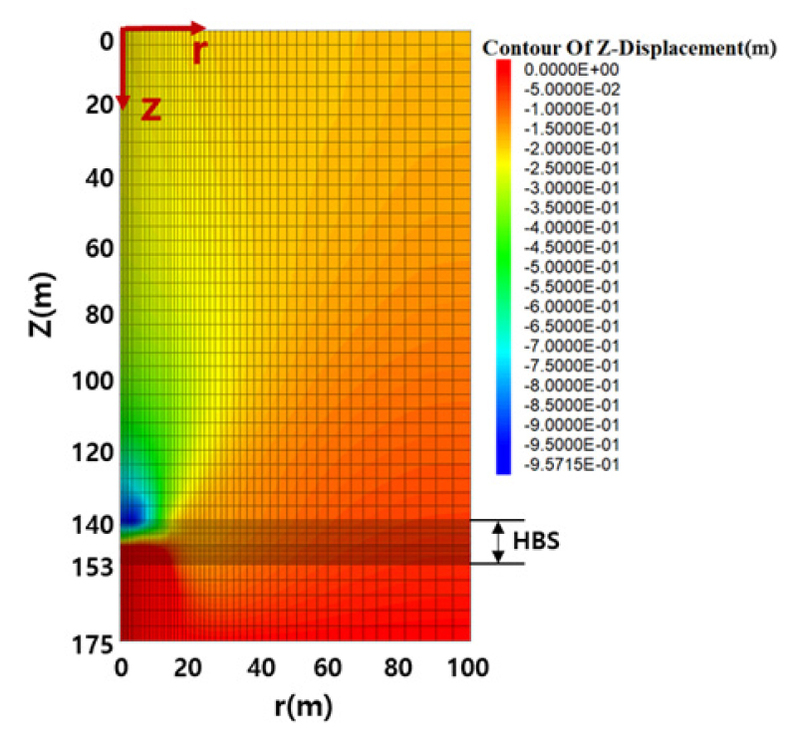 For this purpose, subsidence and displacement velocity were analyzed according to the depressurization conditions. As a result, geomechanical behaviors mostly occurred in the upper hydrate-bearing sediments when the depressurization method was applied. In addition, the effect of bottom hole pressure was greater than that of depressurization rate. This study can be used as a basic data for field production tests in the Ulleung basin. 가스하이드레이트 생산 시 감압법 적용은 부존층의 강도와 강성도 저하를 수반하여 지반 침하를 발생시킬 수 있다. 지반 침하는 부존층 상부 생산 시설과 생산정에 피해를 일으킬 수 있으므로 이에 대한 연구가 필수적이다. 이 연구에서는 동해 울릉분지 현장시험생산 후보지역의 물성을 반영하여 가스하이드레이트 함유 퇴적층에서의 지반 거동을 예측하고자 하였으며, 이를 위해 감압조건에 따른 침하량 및 침하속도를 분석하였다. 그 결과 감압법 적용 시 지반 거동 양상은 대부분 가스하이드레이트 퇴적층 상부지층에서 발생하였으며, 지반 거동에는 감압속도보다 공저압의 영향이 큰 것을 확인하였다. 이 연구 결과는 동해 울릉분지 현장시험생산 계획 수립 시 기초자료로 활용 가능할 것으로 사료된다. Faced with an energy transition era, more reliable economic analyses become mandatory for various businesses using new and renewable energy. This paper presents an economic analysis reflecting various uncertainties through one of the most widely used probabilistic economic analyses, called Monte Carlo simulation. In addition, by conducting a sensitivity analysis aimed at the main variables used in the probabilistic economic analysis, the influence level of each main variable on economic improvement of businesses using ocean thermal energy is specifically clarified. The methodologies and results of this study can be applied to micro-level economic analyses and policy decision-making to disseminate the use of ocean thermal energy on air-conditioning and heating systems. 에너지 전환시대에 직면한 오늘날, 신재생에너지원을 활용한 사업 수행 시 신뢰성 있는 경제성 평가가 그 어느 때보다 크게 요구되고 있다. 본 연구에서는 확률론적 경제성 분석 기법 중 몬테카를로 시뮬레이션(Monte Carlo simulation)을 이용하여 해수온도차에너지 냉난방 도입 시에 수반되는 불확실성을 고려한 경제성 분석을 수행하였다. 또한 해수온도차에너지 이용 냉난방 도입 시 경제성 평가에 활용된 주요 변수들을 대상으로 민감도 분석을 수행하여 각 변수들에 발생한 변동이 경제성 분석 결과에 얼마나 큰 영향을 미치는지를 구체적으로 파악하였다. 본 연구의 방법론과 결과는 향후 보다 세분화된 변수를 바탕으로 한 경제성 분석 및 해수온도차에너지 냉난방 확대를 위한 정책적 의사결정에 널리 활용될 수 있을 것이다. This paper investigated the multistep hydrocyclone particle classification for efficient and environmentally-safe use of by-product slurry from waste concrete treatment. The sludge obtained from the de-watering process of waste concrete treatment slurry is mixed with tap water at different solid-to-liquid ratios (%). Overall, the multistep hydrocyclone system appropriately classified the waste concrete slurry into three different particle sizes. Nevertheless, selectivity increase was observed with particle size under 2 µm regardless of the solid-to-liquid ratio. It is induced by scrubbing of the aggregates during particle size measurement, which were discharged as underflow during the hydrocyclone process. 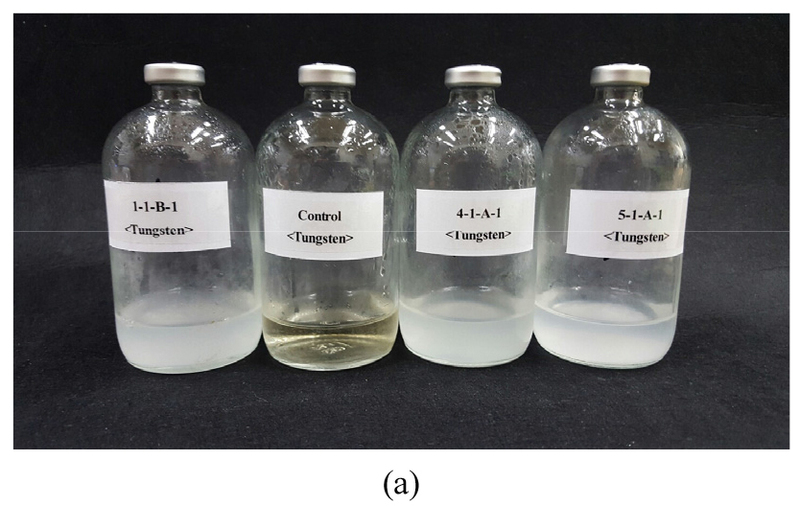 The multistep particle classification system proposed in this study effectively separated the fine particles in the slurry emitted from waste concrete treatment. 폐콘크리트 처리 공정에서 발생하는 슬러리의 효율적이고 친환경적인 이용을 위해 다단계 분급을 통해 슬러리 내 미분을 입도별로 분리하는 연구를 수행하였다. 본 연구에서는 폐콘크리트 재활용 공정에서 발생하는 슬러리로부터 수분을 제거한 슬러지를 다양한 고액비 조건에서 3단계 습식사이클론 시스템을 이용하여 분급실험을 수행하였다. 전반적으로 사이클론 단계별로 입도가 분리되어 폐콘크리트 슬러지의 입도 분리가 비교적 잘 진행되었다. 그러나 모든 고액비 조건에서 2 µm 이하 입도 구간에서는 selectivity가 증가하는 결과가 관찰되었다. 이는 원시료 중 일부 응집제에 의해 뭉쳐졌던 입자가 해쇄되지 못하고 underflow로 배출된 후 입도 분석 과정에서 해쇄되어 미립으로 분석된 것이 원인으로 판단된다. 본 연구에서 설계한 다단계 분급 시스템을 통해 적절한 고액비로 조절한 폐콘크리트 슬러리를 투입할 경우 미분을 효과적으로 입도별로 분급처리 할 수 있을 것으로 기대된다. In the present study, the separation of gold ions from simulated gold leaching solution was performed by selective adsorption of gold ions onto the magnetite. The adsorption efficiency of gold ions increased in neutral pH with increasing agitation speed, temperature, and amount of magnetite added. All of the gold ions were completely adsorbed within 6 h under the following conditions: gold ion concentration 100 mg/L, NaCl concentration 0.1 mol/L, magnetite addition 3.6%, pH 6-8, agitation speed 150 rpm, and temperature 90°C. When gold ions exist with copper and nickel ions, 96% of gold ions are adsorbed onto magnetite particles while the low adsorption of copper and nickel ions was observed, which indicates that selective adsorption of gold ions could be achieved. The efficiency of the separation process would be enhanced by avoiding clogging of screen because the magnetite particles with gold ions on them could be separated by magnetic separation processes. 본 연구에서는 자철석을 흡착재로 이용, 금침출모사액으로부터 금이온을 선택적으로 분리하는 연구실험을 진행하였다. 그 결과, 액중 pH 중성영역대에서 교반속도, 온도, 자철석투입량이 증가할수록 금이온의 흡착효율이 증가하였다. 금이온 농도 100 mg/L 및 염화나트륨 농도 0.1 mol/L, 자철석 투입량 3.6 %, pH 6-8, 교반속도 150 rpm, 반응온도 90°C 조건에서 실험을 수행한 결과 6시간 이내에 금이 100% 흡착되었다. 또한, 금이온이 구리, 니켈 같은 불순물과 함께 존재할 경우 금이온 흡착제거율이 96%인 반면, 구리나 니켈이온은 거의 흡착되지 않아 자철석으로 금의 선택적인 분리가 가능함을 확인하였다. 자철석은 흡착 후 자력 분리가 가능하여 기존 흡착공정내 고액분리공정시 자주 발생하는 체막힘 문제를 피할 수 있어 공정 효율 향상이 기대된다. 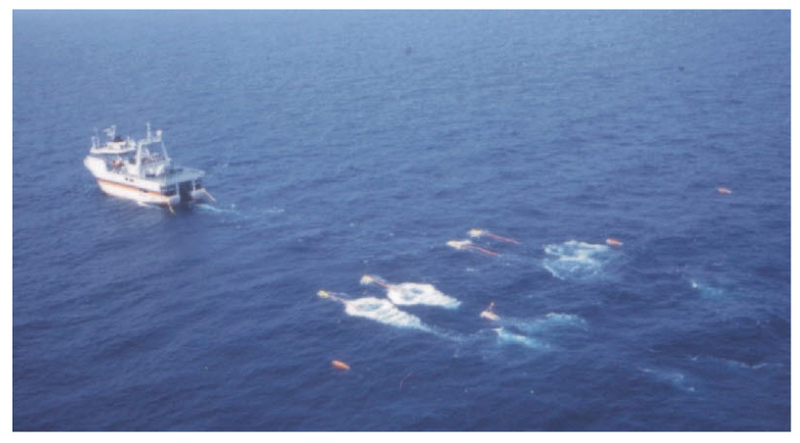 In this study, we examined the current status and future trends of the Korean and overseas marine seismic exploration technology. The marine seismic exploration technology is particularly useful to understand subsurface structures. It has been widely developed to find oil and gas resources in subsurface layers. The seismic exploration technology has been developed from a two-dimensional line survey to three- and four-dimensional surveys of the same area, several times, to identify changes over time. That approach enables an understanding not only of two-dimensional structures along the survey line but also of three-dimensional structures and deformation. In addition to that, attribute analysis and multicomponent seismic exploration technologies have been developed to identify the physical properties of pore fluids, such as oil and gas, and the broadband survey to obtain high-resolution seismic images to prevent specific frequency loss and the various azimuth acquisitions which do not depend on a particular shooting direction. Moreover, multiple attenuation, depth migration, and full waveform inversion have been performed using a supercomputer composed of PC clusters or GPUs for data processing. Various attribute analysis technologies that use computers were considerably developed for data interpretation. Finally, a high-resolution shallow exploration technology, which uses an oil exploration technology, has been developed for precise engineering exploration and geological shallow water survey. 이 논문에서는 국내외 해저 탄성파 탐사 기술의 현황과 향후 발전 방향을 알아보고자 한다. 해저 탄성파 탐사는 해저 지층구조 파악에 매우 유용한 기술로 해저에 부존하는 석유와 가스 자원을 찾기 위해 크게 발전하였다. 탄성파 탐사 기술은 측선을 탐사하는 2차원 탐사에서부터, 일정 지역을 조밀하게 탐사하는 3차원 탐사, 같은 지역을 여러 번 탐사하여 시간에 따른 변화를 파악하는 4차원 탐사로 발전하여 측선 단면상의 지층 구조뿐만 아니라 입체적인 지층 구조와 변형의 파악이 가능하게 되었다. 한편 석유 ․ 가스와 같은 유체의 부존 특성을 파악하는 속성 분석 또는 다성분 탄성파 탐사 기술이 발전하였으며, 특정 주파수 손실을 방지하여 고해상도의 탄성파 영상을 획득할 수 있는 광대역 탐사와 음원-수진기 방향에 편중되지 않은 자료를 취득하는 방위각 탐사가 발전하였다. 그리고 PC 클러스터 또는 GPU로 구성된 슈퍼 컴퓨터를 이용하여 자료처리 분야에서 겹반사 제거, 심도영역 참반사 보정과 파형역산이 수행되고 있으며, 자료해석 분야에서 컴퓨터를 이용한 다양한 속성 분석 기술이 크게 발전하였다. 또한 정밀한 엔지니어링 탐사와 천부의 지질 조사를 위하여 석유탐사 기술을 응용한 천부 고해상 탐사기술이 발전되었다.